The undercarriage system has 4.3 psi (29.6 kPA) ground-bearing pressure in soft ground and allows the machine to track quietly and smoothly. The model’s rubber tracks have a tread design that helps reduce the risk of turf damage while turning. 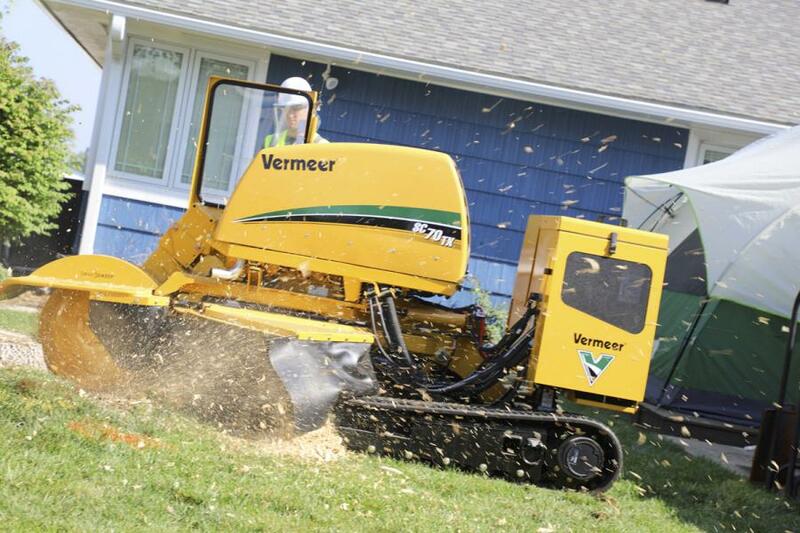 Vermeer enhanced its professional tree care equipment product line with the introduction of the SC70TX stump cutter. Equipped with a 67 hp (50 kW) Cat turbocharged, Tier IV Final/Stage IIIB diesel engine, the SC70TX stump cutter delivers power to the cutter wheel and can travel up to 1560 rpm. "Vermeer designed the SC70TX stump cutter for challenging residential, commercial, municipal and rental applications," said Todd Roorda, tree care, rental and landscaping sales manager at Vermeer. "We have made several enhancements upon qualities to create a powerful and efficient machine. We know contractors will be pleased with the power, speed and controls of the SC70TX model." The ground speeds of the SC70TX stump cutter will be noticeable to operators the moment they take it off the trailer. With a transport speed of 65 ft/min (19.8 m/min), contractors can maneuver much more quickly from stump to stump. The undercarriage system has 4.3 psi (29.6 kPA) ground-bearing pressure in soft ground and allows the machine to track quietly and smoothly. The model's rubber tracks have a tread design that helps reduce the risk of turf damage while turning. Vermeer also has incorporated performance and safety features found on its other stump cutters, including an operator presence system that stops the cutting wheel when an operator disengages contact with capacitance-sensing control handles and the SmartSweep control system that monitors the engine speed and automatically adjusts the cutter wheel sweep speed to maximize power to the cutter wheel while reducing engine stress. An optional remote control that gives the operator visibility and flexibility also is available. The SC70TX stump cutter has an efficient direct drive that maximizes the amount of horsepower to the 23-in. (58.4 cm) cutter wheel, and the Vermeer Yellow Jacket cutter system allows for efficient and convenient serviceability.